I had first planned on doing a "Fall" theme this week, but then decided to postpone it until the trees were in full color. 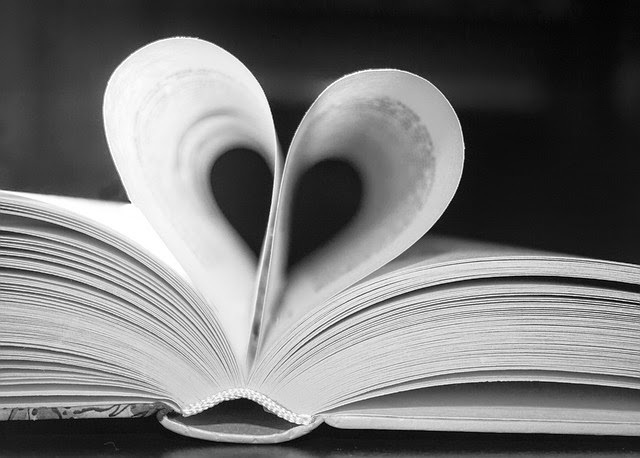 I didn't really have another idea, and there were a couple of new books that I really wanted to try, so today's theme was "Books Miss Jennifer Wanted To Do". I do use themes most of the time because I like having some direction, but occasionally just pull books I want to try out (for more discussion, see my previous post "To Theme, Or Not To Theme"). We started with our welcome song, introductions, and our story song. I led into our first book, Is That Wise, Pig? by Jan Thomas, by mentioning how it's nice to eat warm soup when the weather starts getting cooler. I love Jan Thomas books because of their simple, bold illustrations and good silly fun, and I couldn't wait to use this after it came out. 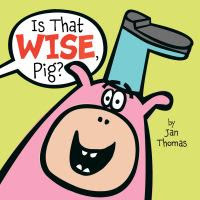 In this story, Mouse, Cow, and Pig are making soup, each contributing different ingredients in increments of 1 to 10, but Pig's contributions are highly questionable, prompting Mouse and Cow to ask, "Is that wise, Pig?". We followed that with a simple song that let us pretend to make soup as well. You can have the kids suggest ingredients to add, or use small fabric or plastic food props (I have some, but forgot them). I like to throw in a silly ingredient, like dirty, stinky socks, to see the kids' reactions. Our second book was also a new book I just saw yesterday, Hooray For Today! by Brian Won. His first book as author and illustrator, Hooray For Hat!, turned out to be a big hit last year, so I was eager to give this one a try. Owl has just woken up and is looking for her friends to play with, but they are all tired and ready for bed, and by the time they wake up, Owl is ready to sleep. It can be lonely being nocturnal. Like the first, this book has animals to identify, lots of repeated phrases the kids can say, and the opportunity to predict what might happen next. This led to a fun song that I used previously in an "Owl" storytime that allowed the kids to move a little bit and pretend to be owls, and ends with them sitting down. Open your eyes up big and wide, big and wide, big and wide. Open your eyes up big and wide, just like an owl. Fly up in the tree and sit on a branch, just like an owl. Turn your head and say "Who, who? ", just like an owl. Our last book was not brand new (2013), but I just hadn't ever gotten around to using it, and decided why wait? 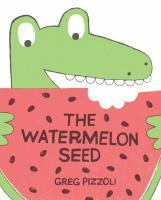 In Greg Pizzoli's The Watermelon Seed a crocodile tells us how much he LOVES watermelon. But then, he accidentally swallows a seed, and fears the worst. As his tummy rumbles and begins to feel funny, he imagines a watermelon growing in his belly and vines coming out his ears. The kids will love the hilarious way in which the true fate of the seed is revealed. A watermelon seed, (A watermelon seed). In my tummy, (In my tummy). After a few silly-billies insisted that they did have rain and sun in their tummies, we finished with our closing song and passed out stickers. We had a lot of fun, and no one missed having a theme at all. I would say Is That Wise, Pig? was the favorite, but they liked them all. I really enjoyed it as well, and thought it was a great storytime book. I liked Hooray For Today! for all the participatory elements, so the kids could join in saying "Hooray For Today," identify the animals, predict they would say they were sleepy, and repeat Owl's good-night to each animal. It's maybe not quite as good as Hooray For Hat, after all it's more fun to be grumpy, and there's more feelings to discuss, but it's very close. The Watermelon Seed was funny and nice and short for the younger ones, since three books is pushing it a little. Just like the previous class, they seemed to really like the "Just Like An Owl" song and loved "hooting", and they had fun with the soup song, suggested all kinds of ingredients and really getting into slurping to taste it. One thing I find funny, is that they always seem fascinated by my library badge I wear on a lanyard around my neck. There at least a couple that ask about it every time. I told them it's my name tag, and that it tells people I work for the library, so people know I'm not just a stranger wandering around their school. 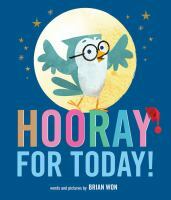 I loved Hooray for Hat, so I'm really looking forward to getting my hands on a copy of Hooray for Today! When I first saw "Hooray For Hat" I knew it would be good for storytime, but I was surprised by just how much the kids liked it.